To be successful, an arts organization needs more than great artists who make great art. It also needs supporters and volunteers who provide the foundation that makes great art possible. The Grand Rapids Symphony honored five women on Tuesday for their contributions to build and maintain a world-class, professional orchestra in West Michigan at its 2017 BRAVO! Awards. The extraordinary dedication and exceptional service to the Grand Rapids Symphony of Kate Pew Wolters, Diane McElfish Helle, Karen Henry Stokes, the late Linn Maxwell Keller, and Lori Lee Curley were recognized at the ceremonies, which included a dinner and a performance by the Grand Rapids Symphony. 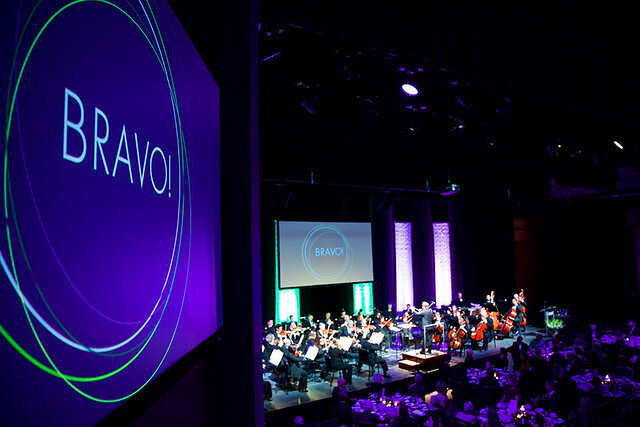 “Each had a passion for the Grand Rapids Symphony,” David Dams, co-chair of the 2017 BRAVO! Awards together with Gina Paul and Larry Robson. The gala held on Tuesday, Nov. 14, in DeVos Performance Hall, raised $154,000 to support Symphony programming including the Gateway to Music, a matrix of 17 access points for music lovers of all ages and abilities. Music Director Marcelo Lehninger led the Grand Rapids Symphony in music by Beethoven and Tchaikovsky plus Manuel de Falla’s Suite No. 1 from The Three-Cornered Hat as part of the program. Kate Pew Wolters, who previously was awarded a BRAVO! Award in 2013, was presented only the second BRAVO! Lifetime Achievement Award in the history of the awards. The first was awarded in 2007 to philanthropist and benefactor Helen DeVos, who died in October. “Kate also is a woman who knows how to get things done,” added Robson, currently Vice Chairperson of the Grand Rapids Symphony’s Board of Directors who received a BRAVO! Award at the last gala. During Wolters’ two-year term as Board Chair from 2015 to 2017, the Grand Rapids Symphony hired Marcelo Lehninger as music director; it ratified an unprecedented 5-year collective bargaining agreement with its musicians; it adopted a new strategic plan to guide the orchestra’s operations for years to come; and it wrapped up its $40 million Legacy of Excellence Campaign to build an endowment to secure the orchestra’s financial well-being for the future. In accepting her award, Wolters said she recently had discovered an old checkbook register dating back to 1974 containing an entry for tuition paid to Aquinas College as well as a check to buy Grand Rapids Symphony tickets. Diane McElfish Helle, a violinist with the Grand Rapids Symphony since 1980, became the first member of the orchestra honored with a BRAVO! Award since 1991 when violist Daniel Kovats, who also conducted the Grand Rapids Youth Symphony, was honored at the inaugural BRAVO! Awards. Among her activities for the orchestra, Helle inaugurated the Symphony’s pre-concert conversations held before all 10 programs in the Richard and Helen DeVos Classical series concerts. In 2012, Helle launched the Symphony’s innovative Music for Health Initiative, which sends small groups of musicians into area hospital to assist music therapists as well as to entertain and comfort patients and caregivers. In June, Helle was one of five musicians honored by the League of American Orchestras with its Ford Musician Award for Excellence in Community Service. “My heart is so full because I’m on stage where I‘ve lived a lot of my life,” she said. The Pittsburgh native noted her fellow musicians come from all over the United States and beyond to take up residence in West Michigan and enrich the community. “Art matters when you make it for your own community,” she said. That has contributed to the success of the Music for Health Initiative. Karen Henry Stokes, a professional pianist who taught at Cornerstone University and Calvin College, has served many organizations from the Grand Valley State University Board of Trustees to the Michigan Civil Rights Commission. “Karen has a deep and personal understanding of the power of music to enrich and transform lives,” said David Dams, co-chair of the 2017 BRAVO! Awards Gala. “Her efforts certainly have enriched and transformed the Grand Rapids Symphony into a finer institution and one of the crown jewels of arts and culture in West Michigan. Longtime chair of the nominating committee for the Symphony Board of Directors, Stokes is responsible for recruiting and nurturing board members. Stokes, who currently serves as board secretary, said the pleasure is all hers. Linn Maxwell Keller, a professional singer who made many appearances with the Grand Rapids Symphony and Opera Grand Rapids, died in June 2016. She had a determination you had to admire, said her husband, Fred Keller, who accepted the posthumous award on her behalf. “Linn really enjoyed performing. She was dedicated to the work that was to be performed,” he said. Maxwell Keller’s experiences performing with Bach Festivals throughout the world inspired her to launch the biennial Grand Rapids Bach Festival in 1997. But her hard work made it happen. “That was what led to the Bach Festival,” Keller said. At the BRAVO! Awards, the Symphony awarded its Nancy and Ray Loeschner Volunteer Leadership Award to Lori Lee Curley. Introduced in 2013, the award was named for the Loeschners, who were honored with a joint BRAVO! Award in 2001. Nancy Loeschner received the inaugural award posthumously. When the Grand Rapids Symphony took over operations of the Grand Rapids Bach Festival in 2013, Curley was appointed its first president. “With quiet grace and irrepressible enthusiasm, Lori took up the challenges of integrating the biennial festival into the operations of the Symphony while also planning and organizing the festivals’ many evenings of marvelous music,” said Gina Paul, a previous recipient of the Loeschner Volunteer Leadership Award in 2016. Earlier, Curley had served as a member of the Board of Directors and as a past president of the Women’s Committee (now known as Symphony Friends). Over the years, she also served as co-chair of fundraisers including Symphony Showhouse and the “Encore” Cookbook. “My involvement with the musical community has greatly enriched my life,” Curley said while accepting the Loeschner Award. The 2017 BRAVO! Award Gala also payed tribute to the late Roger Nelson, the Grand Rapids Symphony Vice President for Operations, who died suddenly in March 2017. Lehninger, who attended his first BRAVO! Awards Gala since his appointment as Music Director last year, told the audience how happy he was to be part of the community.